"View of the 'Intrepid,' Thaddeus S.C. Lowe's aerial reconnaissance balloon, flying high above the battlefield during the Battle of Fair Oaks, 31 May or 1 June 1862. Troops can be seen on the ground." This seems to be the most rarely published balloon photograph from the Civil War. Here is another rarely shared photograph . 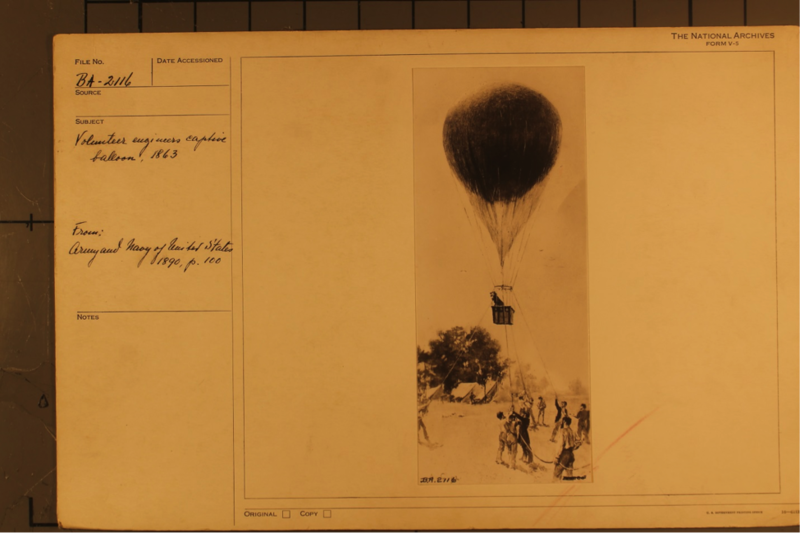 . . BA 2116 Volunteer Engineers Captive Balloon 1863 from Army and Navy of United States 1890 p 100. I always enjoy our resident aeronaut's posts. Is this a photograph or a drawing? It looks like to me like a drawing based on the famous image of Lowe in the basket of his balloon as some of the men on the ground are in similar poses and the basket is at about the same height. Hey on the right side is that a tether for the balloon, or is it just a flaw in the photograph? It is one of the tether lines. Lowe required a minimum of three tethers to help stabilize the balloon as it was in the air which made it easier on the people in the basket as the balloon swayed with the wind. Each line was one (1) mile long and there is record of balloons going as high as 3,000 ft. Much higher than that and the observers loose perspective of what they are looking at on the ground.